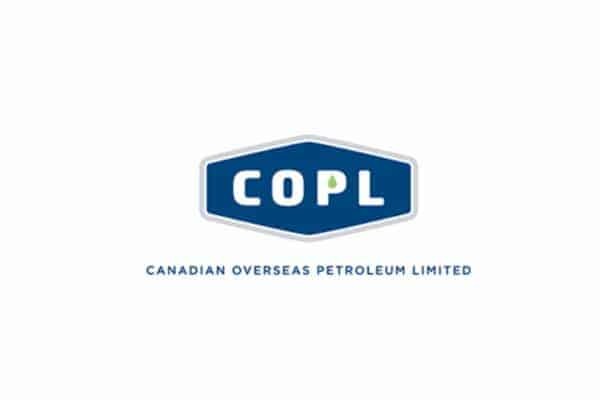 Canadian Overseas Petroleum Limited (“COPL” or the “Company”) (XOP: CSE) & (COPL: LSE), an international oil and gas exploration and development company focused on offshore Africa, announces a market update for the year-ended December 31, 2018. Arthur Millholland, President & CEO, commented: “We have made significant progress over the last year, having secured financing from an African-focused commercial bank and a global commodities trading firm, which will allow us to capitalise on the significant production opportunity that our offshore Nigerian asset represents. With the potential for significant near-term production at OPL 226, we are focused on ensuring this comes on stream as soon as possible, with the first production well scheduled to commence drilling by mid-2019, assuming all steps of the process are in order. “Having achieved certain milestones in 2018, and given the level of interest we’ve received in OPL 226, we enter 2019 with renewed optimism”. In July 2018, COPL’s 50%-owned joint venture company Shoreline Canadian Overseas Petroleum Development Corporation (“ShoreCan”) received and agreed to a project financing and offtake agreement term sheet, providing for a minimum of US$30 million to a maximum of US$50 million Senior Secured Facility, for investment by ShoreCan into its 80%-owned affiliate Essar Exploration and Production Ltd (Nigeria) (“Essar Nigeria”) from The Mauritius Commercial Bank Ltd and Trafigura PTE Ltd. The Facility provides funding for all production-related expenditures following the drilling and testing of the initial production well to be drilled by Essar Nigeria on its 100%-contracted interest in OPL 226. The funding is subject to a number of conditions including an equity contribution by ShoreCan of a minimum of US$20 million and the arrangement of an additional US$100 million of project financing and the provision of services by ShoreCan for the work programme. The Company continues to work towards advancing ShoreCan’s financing activities together with its joint venture partner Shoreline Energy and its investment bankers. As such ShoreCan has entered into discussions with three large oil service providers, with activities in West Coast Africa. The providers are not only offering the provision of services, but also financing. This level of interest reaffirms COPL’s long-term view that OPL 226 is an attractive opportunity with significant upside potential. COPL expects to drill the first appraisal well at OPL 226 by mid-2019 and place it in production through an Extended Well Test (“EWT”) utilising an Early Production System (“EPS”). This will be followed by the drilling of up to three additional similar wells on the prolific NOA Structure – all set to come onstream by the end of 2020. This phase of the project would precede a full field development, after OML conversion offering significantly higher production levels. The offshore Nigerian Block OPL 226 has an area of 1,530 square kilometres and is situated approximately 50 kilometres from the Nigerian coast in water depths of 40 to 180 metres. OPL 226 surrounds OML 83 which contains the Anyala oil and gas field that was discovered by Texaco’s Anyala-1 well in April 1972. Historically, only five wells have been drilled in OPL 226, including the Oyoma-1 and Dubagbene-1 oil and gas wells having 36.2m of net oil and gas pay and 8.2m net oil pay respectively, that were both drilled in 1972 only a few months after Texaco discovered the Anyala anticline. The Nduri-1 well was drilled in 1973 and encountered 9.0m of net gas pay and the HJ South-1 well (1988) intersected 8.5m of net gas pay. The fifth well drilled was the Noa-1 discovery well that was drilled in 2001 by Solgas. All wells drilled in the block encountered hydrocarbons. All wells drilled before 2001 were spotted on 2D seismic lines. A Production Sharing Contract (“PSC”) for OPL 226 Licence was awarded to Essar Exploration and Production Limited (Nigeria) (“EEPLN”) in 2010 after paying a signature bonus of US$37 million. The Exploration Period of this license of 5 years was divided into Phase I (3 years) and Phase II (2 years). Phase I of the Exploration Period required the acquisition of 500 km2 of new 3D seismic survey and the drilling of 1 well. Additionally, Phase II of the Exploration Period requires the drilling of 2 wells and the acquisition of another 500 km2 3D seismic survey. EEPLN completed the acquisition of a new 568 km2 3D seismic survey in 2012 of the first exploration phase. ShoreCan has completed an extensive “state of the art” seismic inversion and interpretation project incorporating rigorous rock physics analysis of the Essar Nigeria long offset 3D seismic survey shot in 2012 that has led to the following aggressive drilling plan. The proposed drilling plan for OPL 226 comprises a 3 to 4 well program to appraise the Noa East lobe; as well as the Noa West lobe that contains Noa-1 discovery well drilled in 2001. The plan assumes the wells will undergo an EWT program utilizing an EPS. The purpose of this program is to provide extensive reservoir performance data to aid in the formulation of a full Field Development Plan (“FDP”) as part of an application for OML conversion. The development scheme is based upon one horizontal production well and three deviated production wells, with a spare well slot contingent upon reservoir performance. At this time, the Company is exploring facility options. Discussions are taking place with several offshore service providers to provide project financing and accompanying services for the project. The first phase of the field appraisal will include three to four production wells, with each well designed for production rates of 6,000-10,000 bbl./d. The initial extended well testing will provide cash flow to the Company and necessary reservoir and flow assurance information to support drilling further appraisal wells for the purposes of constructing a larger, more comprehensive Field Development Plan under an OML conversion application. This initial appraisal proposal only concentrates on the area around the known discovery well, Noa-1. A potential next phase appraisal/development plan could include the drilling of a total of up to 28 additional producing wells, 3 gas injection wells and 5 water injection wells along with more robust surface and sub-surface facilities. Should the initial appraisal wells prove successful, the Company has put together a speculative picture of what a next phase might look like in the Noa complex. It has been assumed that additional development of Noa East along with development of the Noa North and Noa Northeast mapped accumulations would be the most appropriate to follow on after the first phase. Beyond follow-up exploitation of Noa East, North, and Northeast, there is considerable additional hydrocarbon exploration potential identified within Block OPL 226 and the surrounding area, and this may be considered as future satellite development potential for the Noa facilities. The development of Noa will provide the crucial subsea infrastructure hub necessary to facilitate further commercial development of the area. The Company is progressing discussions with the Government of Mozambique regarding the terms of the production sharing contract governing onshore Block PT5-B (awarded to its bidding consortium in the 5th Licensing Round). The Block is located on the Mozambique coastal plain, 750km north of the capital of Maputo. It is 4,356 sq. km in size and surrounds the north, west and south west margins of the Pande Gas Field, half of the Pande-Temane Gas field complex which has reported gas reserves of 2.6 TCF and production in 2016 of 475 mmcf per day. The gas is primarily exported by pipeline to South Africa. In February 2017, Sasol, the operator of the Pande-Temane gas complex, announced a light oil discovery and the construction of a crude oil and LPG processing facility in an adjacent area to the east called Inhassoro. The Company believes Block PT5-B is prospective for light oil and gas in the productive zones at Pande, Temane and Inhassoro as well as deeper horizons. The Company believes Block PT5-B offers potential for additional gas and light oil resources based on its review of the historic 2D seismic data base.